Washington, D.C., circa 1938. 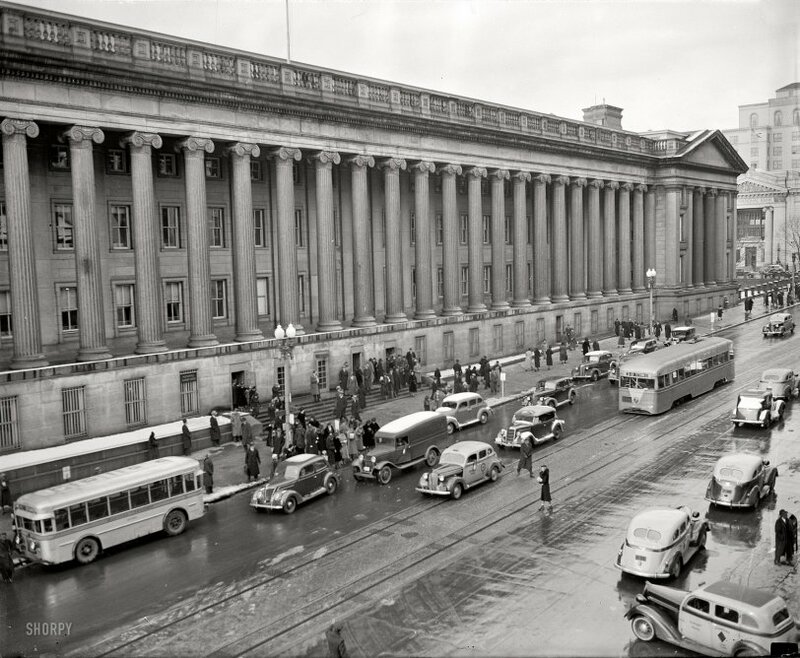 "Street scene, U.S. Treasury, Fifteenth Street." Harris & Ewing Collection glass negative. View full size. Submitted by cmdecker on Sun, 02/07/2010 - 8:19pm. My grandmother might very well be in this photo. She worked at the treasury dept for several years, including 1938. I wish there were some way to zoom in on this in a clear way to make out more details. It would be incredible to see! Submitted by ChicagoBob on Fri, 06/12/2009 - 8:21am. Nice to see a touring car (the '35 Ford Phaeton behind the taxi) in adverse weather. These cars had no side glass, so they were inexpensive, lightweight and stylish, but breezy! The side curtains were so cumbersome that I imagine sometimes they weren't worth the trouble, even in a car that could hit 80 mph. I also love that '37 Ford flatback sedan. Ford built some of the industry's greatest body shapes in the 1930s. Submitted by Steve K. CALIF on Thu, 06/11/2009 - 9:12am. I really like the "slow/Stop" arm positions of the drivers of the delivery van and taxi cab while waiting for the '37 Ford to pull away and the lady to cross the street. Most young drivers today most likely not know the meaning of this signal! Common signal then as were the arm positions for left and right turns, too. Submitted by Kilroy on Wed, 06/10/2009 - 9:24am. Submitted by chollisr on Wed, 06/10/2009 - 8:59am. Until late 1990s, the reverse of the U.S. $10 bill featured a streetscape very similar to this image. The buildings haven't changed much, but the traffic patterns have. That's Pennsylvania Avenue in the upper right corner, a portion which has since been closed to vehicular traffic in our post 9-11 world [Actually closed since 1996 - Dave]. The "streamlined" streetcar is one of the first of its kind anywhere, built in Philadelphia in 1935 by the J.G. Brill Company and is part of a batch serialed somewhere between 1001 and 1010. This is a close forerunner to the PCC streetcar featured in an earlier post. Submitted by sjmills on Wed, 06/10/2009 - 8:52am. That's a cool looking bus. It looks like it goes both ways, like the streetcar, but the seats are all facing the front, and a bidirectional bus would be silly. Submitted by Anonymous Tipster on Wed, 06/10/2009 - 6:55am. The streetcar looks like a PCC car, but it's actually a pre-PCC built in the mid 1930s before the PCC design was finalized.